The Collective team have recently returned from a very exciting trip to Heidelberg to visit the Ophelis showroom and factory. It was a great opportunity for our newer members of staff to get a better feel of the products (literally) and get an overview of the whole product range! Ophelis is a high end furniture manufacturer that makes a beautiful range of office and residential fittings that we have the pleasure of representing in the UK. 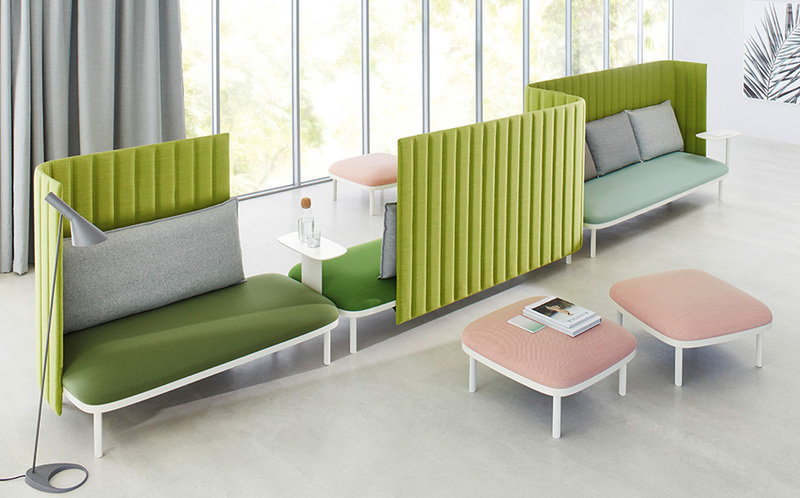 Their collection is vast and colourful, ranging from modular soft seating systems to conference tables to acoustic storage. We were hosted by the very lovely Holger, who organised a comprehensive training session for us plus a visit to the factory where all the magic happens. It was so humbling to see a family run business taking so much care and attention with their products, most of which are made manually. The Ophelis showroom was like entering the equivalent of Willy Wonka's chocolate factory for furniture. The bright colours and unique designs are one off, with every corner being a different configuration, really showcasing how to fill varying spaces with the Ophelis range. It's the type of the furniture that would fit perfectly into university break-out areas, co-working spaces, airport lounges etc. Two main ranges that are close to our hearts are the Sums and Docks soft seating systems. Described as 'Island's in a room', both Sum and Docks highlight the spectrum of layout options not often seen with items of seating. The systems can be adapted to changing work and space requirements with ease, acting as places of retreat in busy environments. The colour and fabric options are almost never-ending which is great for changing decor trends and all with matching accessories. What's great about it is that the customer designs what they want for their space and it's unlikely you will see the same elsewhere. Ophelis and it's staff have a very clear passion for what they do, which shone throughout our visit. We can't thank Holger enough for his hospitality, we were very well looked after and thoroughly enjoyed the whole experience. We're now full of knowledge and raring to get these products out there even more than before. Since we first caught a glimpse of the newest release from Ophelis at Orgatec 2016 we have been looking forward to this day. Today, we can very happily say this stunning range of soft seating is in production and available here in the United Kingdom. Born from the essence of Ophelis' award winning rage docks, Sum is completely modular so can be configured to the space and user requirements. High back, mid back, table, and cushion elements can be selected specifically to improve acoustics, create privacy, a touch down workspace or just a stunning piece of comfortable, enticing furniture. Soft upholstered curves, clean frame lines and options for integrated power give Sum timeless elegance combined with the much contemplated and thus divine colour range which truly sets this range a cut above. Watch out for Sum shining in open plan offices, hotel lobbies, universities and co-working spaces. Find out more at the Sum website or contact us for more details on pricing and purchasing.